Every creator dreams of “going viral,” but it is almost impossible to predict what type of content people will share. Although going viral is not an exact science, there may be a few things you can do to increase those chances. I stumbled upon an amazing article via BloggingTips.com that really put things into perspective for me. Here are seven tips from the article and how they inspired me to change my blogging game plan. 1. Positive emotions get the most social shares. According to BuzzSumo: awe, amusement and laughter grab the most attention from viewers. My input: We as a society are constantly searching for happiness, so it only makes sense. We often look for things to entertain, teach or inspire us. No one searches the Internet looking for sadness or aggravation. Aim to create videos that evoke positive emotions, rather than negative ones (anger, sadness, etc.). For example, perhaps your viral content can offer fitness instruction and inspiration. There are a lot of fitness gurus on Instagram that have gained popularity because they inspire others to be more disciplined with their health and fitness routines. These gurus post videos of their workouts, pictures of their meals, etc. 2. The more readable, the better. BuzzSumo says the most shares go to infographics, “top” lists, “why” posts, “what” posts, how-to’s, and videos. My input: I’m a big fan of infographics. In fact, these seven tips I’m writing about are derived from one. Simplifying information allows viewers to grasp as much information in a short amount of time. Nowadays, people across social media have such short attention spans. If information is organized and readable, it is easier to retain and share. Also, if someone cannot understand what you are writing, they simply cannot relate. SocialMarketingWriting.com shares six ways to make your blog posts more readable..
3. Having at least one image in your written posts leads to more shares. Facebook articles with an image are 2.3 times more likely to get shared, and articles with an image on Twitter are 2.1 times more likely. My input: Visuals, visuals, visuals! The fact that you need to incorporate visuals in anything you post should already be drilled into your head. Because wouldn’t you rather stumble upon a visual versus a full page of boring text? My input: When producing content for social media, we only have a short amount of time to catch our viewers’ attention. In a Social Media Week event I recently attended, one of the panelists Chris Paper introduced what is called Facebook’s “three-second audition” — if your Facebook content isn’t great in three seconds, people aren’t going to watch or engage. The fact that you have such a limited amount of time to catch a viewer’s attention relates to all content you post on social media. Your viewers are forever swimming in information, so they have the luxury to pick and choose what they want to read. If your content doesn’t catch their initial attention, they will never get the chance to share your content. It’s kind of like making a good first impression on a first date. If your first impression is great and they like you, they’ll end up “sharing” you with their friends. 5. People will share content if they think it’s from a trustworthy source. Add a byline at the top of every post and an author/bio at the bottom. My input: If your job as a blogger is to inform, no reader wants to spend their time reading false “junk” (which oversaturates our Internet). The more trustworthy content looks, the more likely one is to read and share it. For journalists and bloggers, finding expert sources is free and easy with ProfNet. Just fill out the form and send in your query. 6. Try to attract influencer shares. Include them in content through quotes, anecdotes, etc. Mention influencers in your social network and ask for feedback. My input: Aside from mentioning influencers in your social network, I believe Twitter has amazing capabilities when it comes to attracting influencers. Whenever I post a blog, I tweet it. If I know of a certain event hashtag or any niche hashtag, I will include it in my tweet. It increases the findability of my content. The chances of being retweeted by influencers or even favorited are great. If not, other people are able to find you within that niche hashtag and act upon your content as well. I would say the same applies with Instagram. If you post an infographic or video on Instagram, try tagging an influencer and including a few niche hashtags in your caption. 7. Share at the right time. Sharing at 9 a.m. and noon ET increases your chances of going viral. Do not share during rush hour. My input: I honestly think this concept varies from person to person. Social Media Today even suggests different times to post, depending on which social media platform you are using. If only “Social Media Posting Times” was a science, we’d all be happier bloggers. My advice is to study your audience — define who they are, think about what their day is like, and then apply what you know. There are also many tools online you can use to analyze your webmetrics (but that’s another discussion in itself). 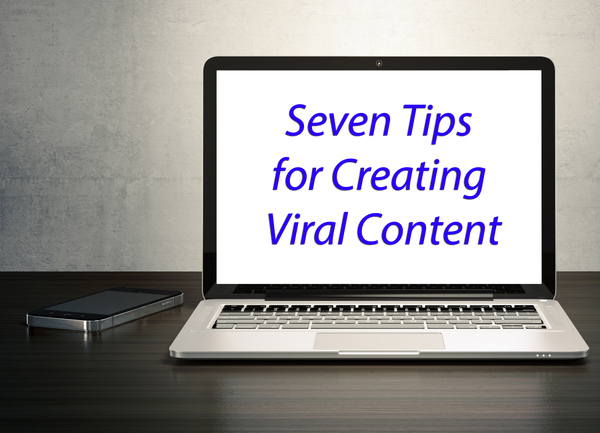 Good luck creating viral content! If you need help finding story ideas or connecting with expert sources, let us know. PR Newswire for Journalists is your one-stop shop for newsgathering with access to customizable newsfeeds, ProfNet expert queries and our multimedia gallery. Best of all, it’s free. Sign up at prnmedia.prnewswire.com or contact us to learn more.